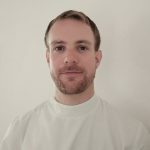 Geoffrey began his training at the British School of Osteopathy in 2006, graduating with a Master of Osteopathy degree and a distinction. Since 2008, he has been treating patients of all ages with all sorts of aches and pains from head to toe. He always ensures that the patient has received a full explanation of where the pain is coming from and why it was able to happen so that they can reduce the likelihood of a re-occurrence in the future. By providing easy and appropriate stretches and ‘do and don’t’ advice to the patient he involves them in their own healing process so that they can regain control over their injury. His treatment is primarily structural but incorporates several different other approaches when appropriate, including Western Acupuncture, Balanced Ligamentous Tension and sometimes Cranial Osteopathy all of which he has completed further training in. Geoffrey is a keen runner, swimmer, gym goer and a fair-weather cyclist. He enjoys treating all musculo-skeletal injuries including sports injuries, neck pain, back pain and general aches and pains as well as work related postural strains.